When’s My Next Rest Day? | Keep It Up, David! When’s My Next Rest Day? I’m usually pretty good at listening to my body. I like working out and pushing myself, but I understand the importance of giving my body the occasional day to recuperate. Right now, my goal is to exercise six times a week (five is acceptable, but six is ideal), and even though I switch up my workouts, it still takes a toll on my body. Sometimes, I plan rest days into my schedule. My last rest day was on March 5th, which was my birthday – the perfect day to relax and focus on more important things (like the major fitness challenges I gave myself). Other times, I just listen to my body, which is pretty good about letting me know when it needs a break. My body’s main modes of communication are fatigue and soreness (above and beyond standard post-workout soreness), but it’s sending mixed messages right now. It’s probably because my workouts have been a little bit different this week. First off, I haven’t lifted weights since Saturday, when I spent about a half hour in the weight room, after using the StairMaster for 20 minutes (more on this later). It wasn’t an intentional plan to go most of the week without strength training – it that happened that way. And now, five days later, I’m itching to lift weights. Secondly, I tried something new on Sunday, and it was completely successful, and by ‘successful,’ I mean ‘brutally difficult.’ I’ve been doing a lot of StairMaster lately, in preparation for my two big upcoming stair climb fundraisers (donate here or here, won’t you? ), but I wanted to climb actual stairs in an actual building as part of my training as well. There are no super-tall buildings in my immediate neighborhood, but I concocted a challenging plan anyway. On Sunday night, I ran about 3/4 of a mile to a 5-story, completely empty parking garage. Without ever stopping, I ran up one stairwell to the roof, ran across the roof to the stairwell at the other end, and ran down it, doing that loop over and over and over. Sometimes when I reached the bottom, I immediately turned around and ran back up to the roof and continued in the opposite direction. My goal was to do this running/stairs combo as long as possible, without stopping. About 10 minutes in, my side started cramping, but I pushed through it, and I soon settled into a cramp-free rhythm. After 35 minutes, I knew I was close to calling it quits, so I started running home. Three minutes later, I finally stopped. Add in 5-6 minutes of both warm-up and cool-down, and I was on the streets for about 50 minutes. I lost count of the total number of flights I ran, but it was a lot. It felt great. And the next morning, I was sore in every part of both legs. My legs didn’t get much of a break, though – I spent all of Monday at Disney California Adventure, which, while not a dedicated workout, still involved a ton of walking – miles and miles of it, I’m sure. On Tuesday, I took one of Richard Simmons’ classes at Slimmons (which always involve a ton of leg lifts), and yesterday, I went on an hour-long early-morning hike (with a substantial elevation change) with a friend. I feel like it’s time to give my legs a day off. On the other hand, I feel like my upper body has been sorely neglected the past few days, and I wanna do something about it. Help – I don’t know what to do! I’m writing this post late Wednesday night, and my current plan is to see how I feel on Thursday morning. I have a hunch I won’t wake up terribly sore (the hike, while rigorous, was still less intense than most of my standard workouts), so maybe I should push myself for one more weight-intensive session at the gym, and then rest on Friday. On the other hand, I have exercised the past nine days in a row. Do I postpone an upper body weight training session another day and rest, just because I feel I’m due for a rest day? I’m not quite sure what to do when half of my body could benefit from a break and the other half is jonesin’ for more! I’d love your thoughts on the matter – and that’s why I have a comments section, so speak up! Before wraping this up, I wanna rewind back to Saturday. I’ve already mentioned above that I spent 20 minutes on the StairMaster, and it was a good 20 minutes. I didn’t get nearly as frustrated with the machine as I did last time – I just found a pace that was comfortable, covered the display with my towel, and didn’t overly concern myself with my Steps Per Minute. The end result was 300 calories burned and 84 stories climbed! EIGHTY-FOUR STORIES! You know what that means, boys and girls – time to add a skyscraper to my collection! The newest addition to my collection is all the way on the other side of the planet – in a country (and a continent) not yet represented. That’s right – it’s off to Australia! At 80 stories, the Q1 is the fifth tallest all-residential building in the world, and the tallest building in the southern hemisphere. Located in Surfers Paradise, on the Gold Coast, it has apartments that vacationers and tourists can rent – check availability/pricing here. The Q1 has an observation deck called Skypoint, on the 77th floor, overlooking the beach. Once you’re up at Skypoint, you can then opt to do the Skypoint Climb – where you go outside onto a platform, and climb 298 stairs to the pinnacle of the building – where you’re 885 feet above the sidewalk. YES, PLEASE! I wanna go to Australia just to do that! 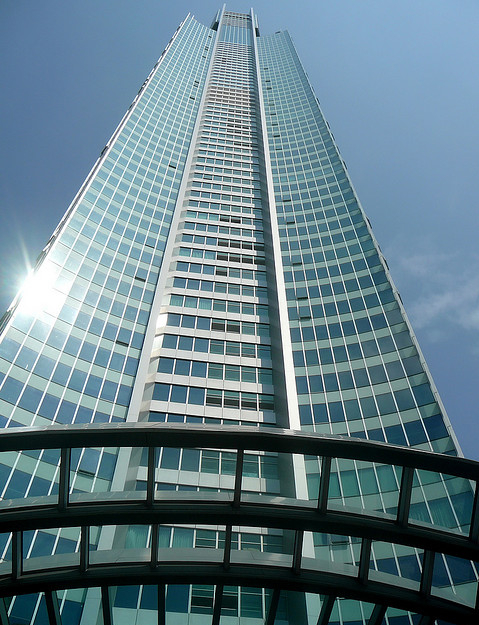 I just added the Q1 to my Skyscraper Collection – so click here to see how it compares to the 26 other skyscrapers that I’ve theoretically climbed! Damn – I love how the Q1 dominates the skyline in that first picture… and I climbed that building, all the way to the top! This entry was posted on Thursday, March 15th, 2012 at 12:42 am and is filed under Uncategorized. You can follow any responses to this entry through the RSS 2.0 feed. You can leave a response, or trackback from your own site. 4 Responses to When’s My Next Rest Day? Hooray David, so exciting to see my home state added to the skyscraper collection! There’s a famous stair-climbing race in Sydney at Centrepoint tower, 1500 stairs I think from memory. Maybe you might consider “climbing” it sometime soon all the way over there in LA! I think you should give your lower body a break, but do the upper body exercises..how about doing the upper body exercises, then sitting in the jacuzzi to soothe your lower body aches and pains? That way you rest the half that needs it..lol.. Right now I’m about to start AM Yoga with three soggy wet dogs nearby..should be an experience! What are you doing for recovery in the way of supplementation? Do you take a multivitamin? L-Arginine? Glutamine? Protein? Are you actually eating enough? Time off is key but so is making sure your muscles are nourished to recover properly. My workout advice; mix your workouts up. If you’re hitting the gym 6 times a week (which is a lot) make sure you’re hitting all of your body parts and giving them rest as well. Time off and time to recover is very key in muscle growth and repair. Thanks, Scott – I appreciate it. I do eat protein (or drink it in a shake) after workouts, but I don’t take any other supplements – never even heard of L-Arginine. Any particular brands/products you recommend?